Monkeypuzzle was created in 1976 by friends Carol Leith and Sally North in a small Norfolk Village. Carol would like to thank Sally and her generous husband Tom for helping to get this company 'born'. Thank you Sally. 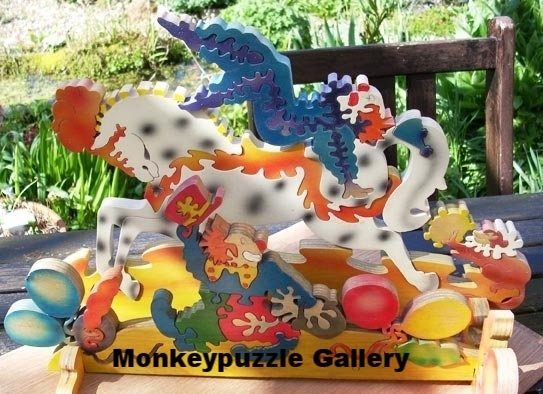 The Monkeypuzzle designs included a wide range of freestanding sculptural jigsaw puzzles. Some of the larger ones were specifically commissioned by galleries and were only produced in limited editions. On the images below you will be able to explore the Monkeypuzzle Gallery, Catalogues and overall history.